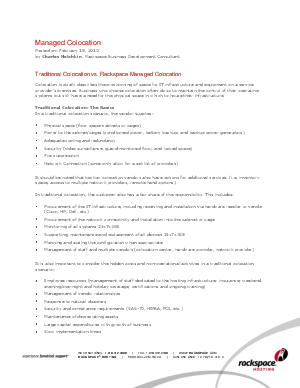 There is no colo offering that promises and delivers what Rackspace Managed Colocation does. Sure, some top tier colo providers offer some of the services. But none of them can come close to providing everything that Managed Colocation does. They cannot deliver the expertise, around-the-clock support 24x7x365 and industry-leading SLAs that you need behind your infrastructure.